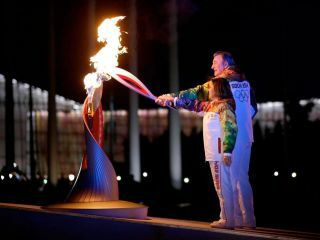 Russian star athetes Irina Rodnina and Vladislav Tretiak use the Olympic torch that flew to the International Space Station to light the Olympic Cauldron in Sochi, Russia on Feb. 7, 2014. The 22nd Winter Olympic Games were launched in Sochi, Russia on Friday (Feb. 7) using a torch that flew to the International Space Station and back. The space-themed Olympic spectacle, which took place as part of an elaborate opening ceremony, also featured cosmonauts helping to raise the Russian and Olympic flags in the Fisht Olympic Stadium and the projection of recorded scenes from the historic spacewalk that carried the Olympic torch into open outer space for the first time. The ceremony began at 8:14 p.m. local time, or 20:14, for the year 2014. Cosmonauts Oleg Kotov and Sergey Ryazanskiy are seen posing with the Olympic torch during a Nov. 9, 2013 spacewalk outside the International Space Station. The same torch was used to light the Olympic Cauldron in Sochi, Russia. The lighting of the stadium's Olympic Cauldron by Russian star athletes Irina Rodnina and Vladislav Tretiak using the space station flown torch signaled the ceremonial start of the Winter Games and the end of the longest torch relay in Olympic history. In addition to the nine station crew members who carried the torch while it was in space, among the 14,000 people who ran with the flame on Earth were cosmonauts Mikhail Kornienko, who in 2015 will begin a yearlong stay on the station; Sergei Krikalev, chief of the Gagarin Cosmonaut Training Center; and Valentina Tereshkova, who last year marked the 50th anniversary of becoming the world's first woman to fly in space. Krikalev and Tereshkova were at Fisht stadium on Friday to hoist Russia's flag and the flag of the Olympic Games, respectively, symbolizing Russia's role as the host nation for the Winter Games. Joining Krikalev for the honor were cosmonauts Fyodor Yurchikhin (who returned from space with the torch), Roman Romanenko, Svetlana Savitskaya and Elena Serova. The unlit torch's journey into space began Nov. 6, 2013, with the launch of the Soyuz TMA-11M crewed spacecraft from the Baikonur Cosmodrome in Kazakhstan. Arriving at the space station just six hours after departing Earth, the torch was brought onto the orbital laboratory and handed off between the station's crewmates, including NASA and Japan Aerospace Exploration Agency (JAXA) astronauts and Roscosmos cosmonauts. Two days later, Oleg Kotov and Sergey Ryazanskiy suited up in Russian Orlan spacesuits (featuring a special torch-themed mission patch) and exited an airlock carrying the torch for a high-flying photo opportunity at the beginning of a 5-hour, 50-minute spacewalk. Once back inside the station and before it was returned to Earth on Nov. 11, Kotov ran with the torch on a treadmill, simulating the marathon relay that was still making its way across Russia on the ground. The flown-in-space, aluminum red-and-silver torch, which for all but the addition of a tether was identical to the other torches used on the Earth, was the first to be carried on a spacewalk but the third to be launched into orbit. Previous torches flew on NASA's space shuttles in 1996 and 2000. The 2014 torch's crossover between the space station and the Olympics underscored the similarities between the two ventures, according to an astronaut currently living aboard the outpost. "I think the key phrase is international cooperation," NASA astronaut Rick Mastracchio said in response to a question posed by collectSPACE.com during a recent Space.com interview. "Both the Olympics and the International Space Station are great examples of what folks can do when the countries get together and try to accomplish something." The station's Expedition 38 crewmembers plan to watch at least some of the Games via recorded videos uplinked by NASA Mission Control in Houston. The 22nd Winter Olympic Games will run through Feb. 23. Click through to collectSPACE.com to see more space-related scenes from the XXII Winter Olympic Games’ opening ceremony.